The African bush is part of us and part of our story. It was just natural that we got married and celebrated our love in it. “It’s just so ‘you guys!’” Countless friends and family members said these words to Graham and I during our wedding. And it really was. We said “I do” in a way and in a place that felt like ours and it felt “like us”. As we stood face to face, with the trees peering down on us in the bush, their arms stretched out as if in blessing and our shoes in the dusty, African earth we knew we wouldn’t have changed a thing. 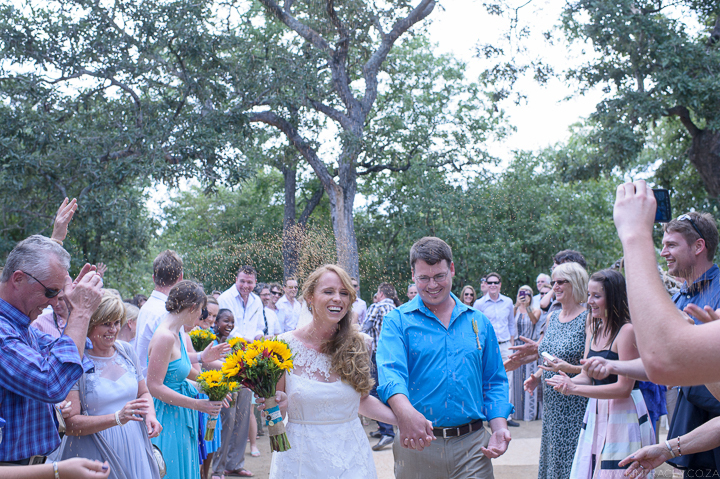 We got married in the Kruger National Park in April this year in proper, laid-back bush wedding style. And it was perfect for us. It was an unboundedly happy and love-filled day and night in one of our most favourite wilderness settings. I smile and my heart gets giddy still as I think back on it all. 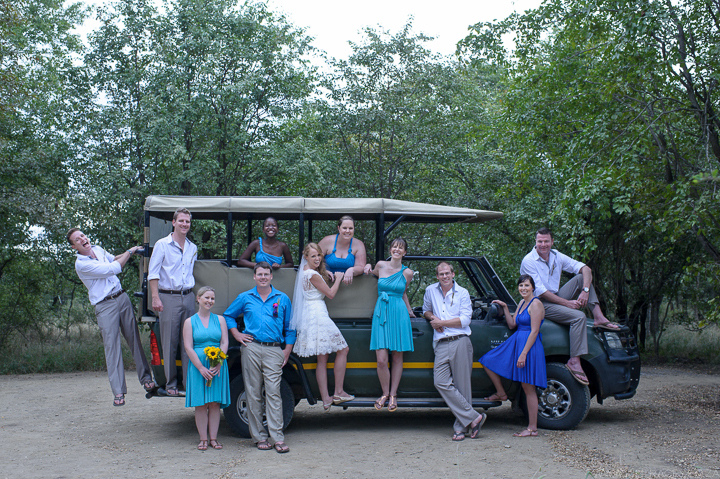 As a couple who are at our happiest when in the bush and who revel in travelling into the African wilderness whenever we can, our decision to have a bush wedding came naturally. Our chosen ceremony spot was at Tsendze Rustic camp in Kruger which we arranged to have all to ourselves and our guests on the day, shared only with the birds. After our big promises were made to each other under that open sky and preserved with a big kiss, our guests acknowledged us a brand new Mr and Mrs with birdseed confetti and more happiness. 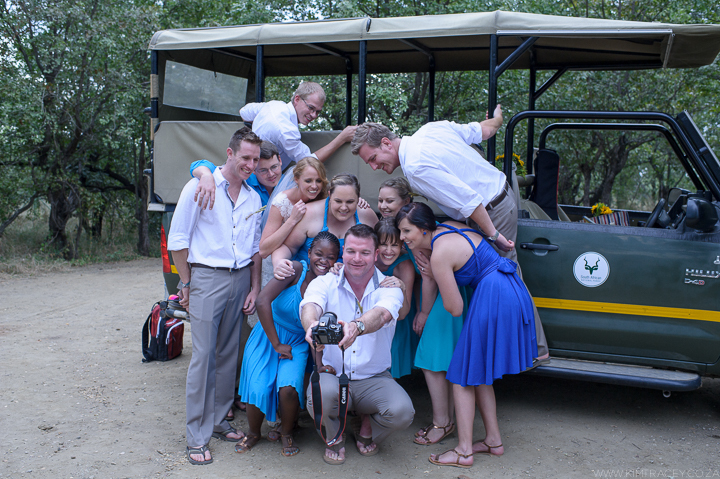 Everyone was then transported in proper safari fashion to our incredible reception site by game-viewing vehicles. 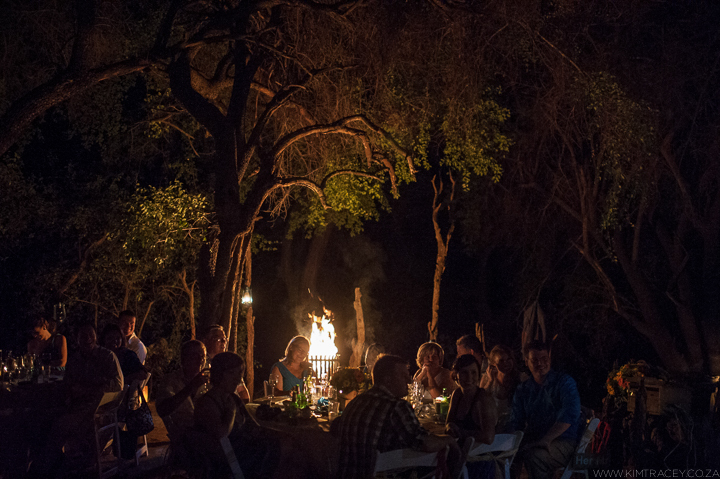 The private bush site, Ndzopforini was our scene for the most amazing evening of merry-making, deep in the bushveld. The ambiance was governed by lantern light, stars and candles with fires burning too. There we celebrated full-heartedly under a canopy of trees in the territory of all things wild and wonderful. * Please excuse and allow me to over use all the gushy adjectives in this blog. Is was my wedding after all. 1. Engaged in the wild. Married in the wild. The wilderness is in our blood and part of our love story. 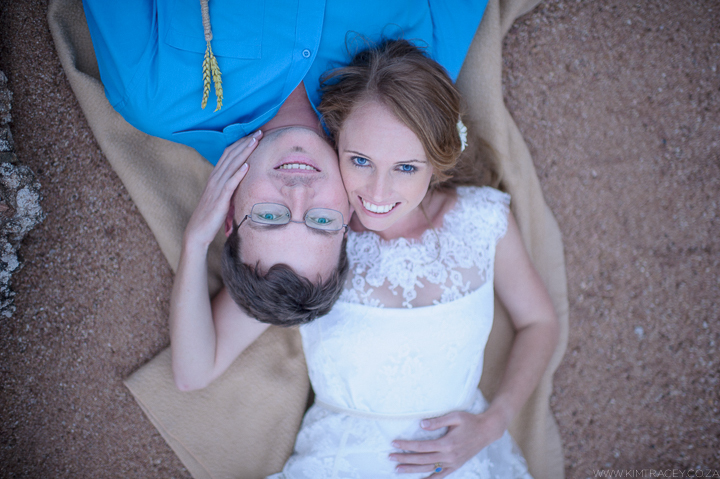 Graham got down on one knee and proposed in 2013 in another perfect African setting – the Makgadikgadi Pans in Botswana. It just wouldn’t have been right for us to get married in a city. Especially after that. We couldn’t bear to deny ourselves the continuum of keeping to our theme for the next and biggest chapter of our love story. 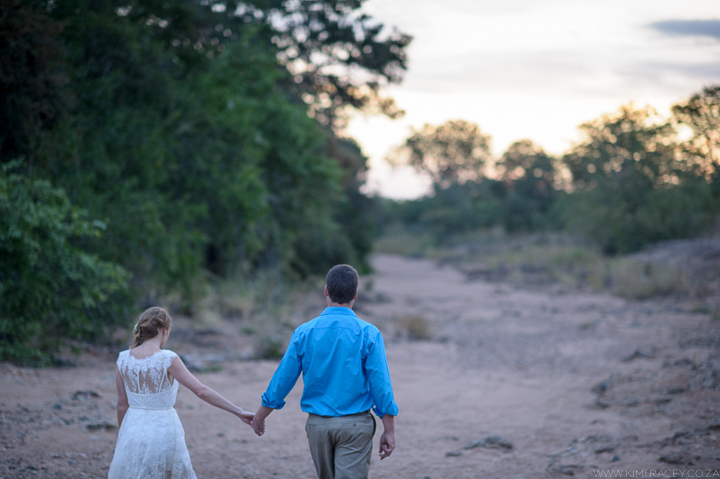 So we kept true to our wild hearts and chose a “wedding venue” that was just right for us and nowhere near a city at all- The Kruger National Park. Before we decided on a bush wedding for sure, we did the usual trek that most engaged couples do to visit a list of potential venues near our home town. It just seemed like the done way to make a start. We saw some beautiful options and we saw some strange, off-putting ones too but we knew pretty early on in our search, that the typical wedding venue thing wasn’t for us. That’s when we allowed ourselves to admit that if we could get married where we really wanted to, it wasn’t going to be at a convenient venue. It was going to be in the bush! If we were doing it in the bush, we were going to do it in the proper bush. We wouldn’t have been content with a bush-theme venue or a small nature reserve venue with a few impala dancing in the background. We wanted a bush wedding. Kruger is a treasured destination for us with wonderful memories attached to it from previous trips. 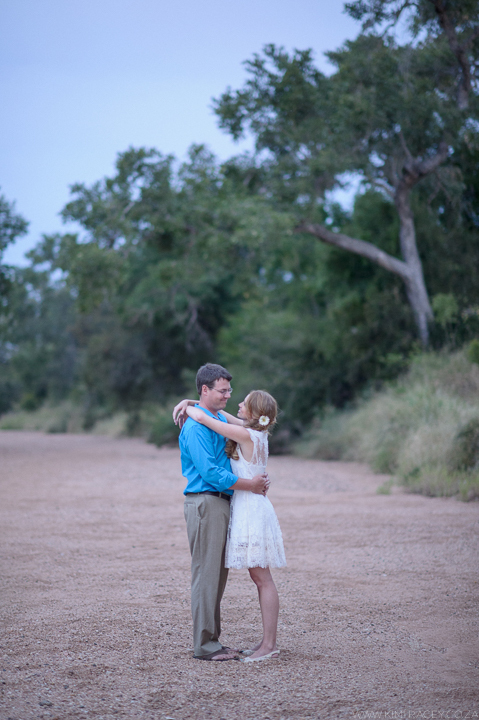 When we brainstormed a few wedding setting ideas, we easily decided on Kruger as our top choice. I knew this would mean planning it all from afar, from a completely different province and dealing with those extra admin issues that this dynamic would naturally bring into it. But that was alright by me. 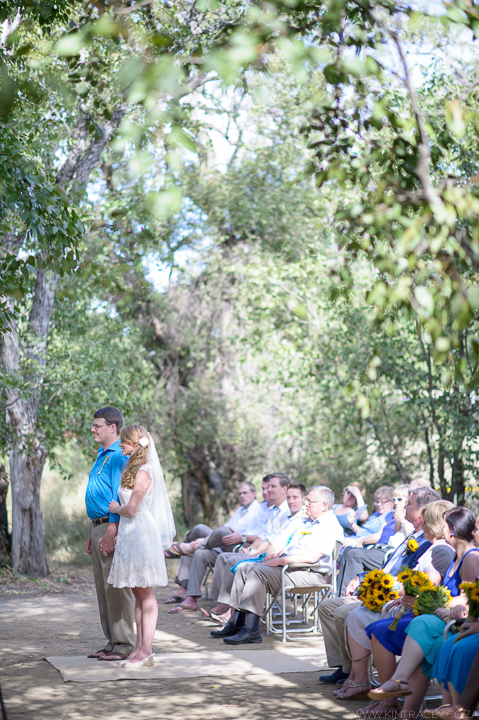 Don’t under estimate the power of emails and phone calls when planning a wedding. It was more than ok that we couldn’t pop in there every few weeks to meet with staff and discuss things. It worked out for us. 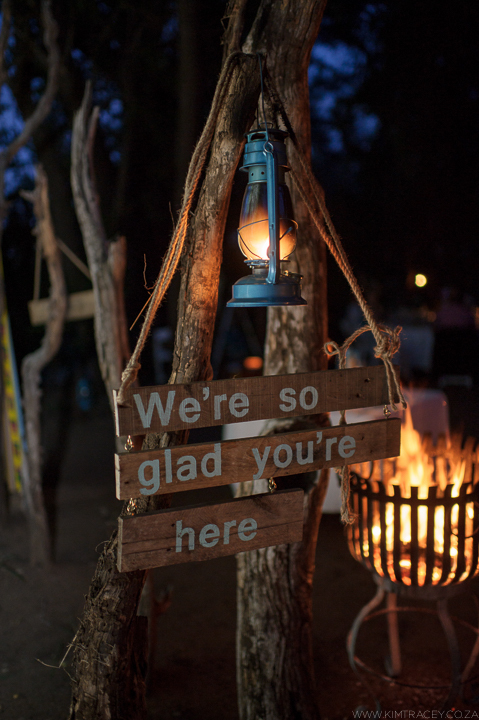 We had heard mumblings about other weddings having been hosted in the park in different ways and I quickly found that our wild-style, DIY bush wedding could be done with the help of some great staff on the ground to help me execute it. Kruger is properly vast and wild while still being superbly run by SANParks and with accommodation options for our guests, no matter their tastes. 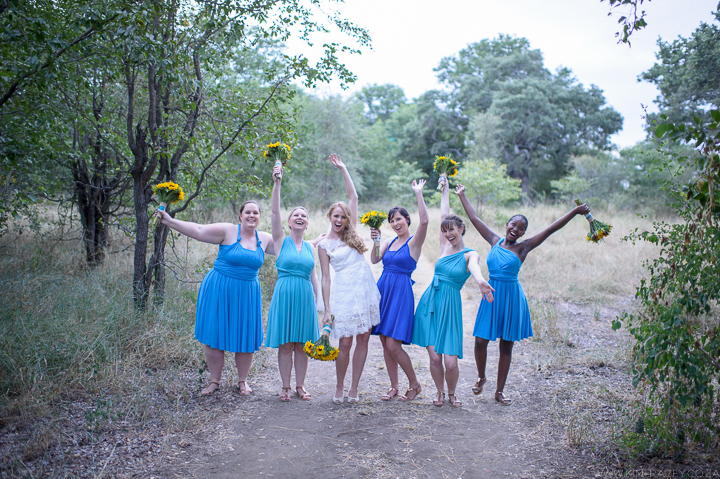 We knew that our bush wedding wouldn’t be a rushed in-and-out affair. It could be, and was, an opportunity for our nearest and dearest to join us for a mini holiday in our favourite setting. Graham and I arrived at the Park a few days before the wedding to slowly make our way to Mopani Camp, camping along the way. We were in semi-holiday mode, with a touch of extra wedding excitement from the time we entered the gates. We met the staff members who would be assisting us on the big day and finalised details. Then from the Wednesday before the wedding our family and friends started arriving and we really cherish that time we had with them. Having the birds in the trees at the ceremony was great but we realised they just wouldn’t have cut it as our music-makers. Instead, we had the best background and arrival music imaginable. I still get emotional thinking back on it and how it set the scene so powerfully and beautifully. 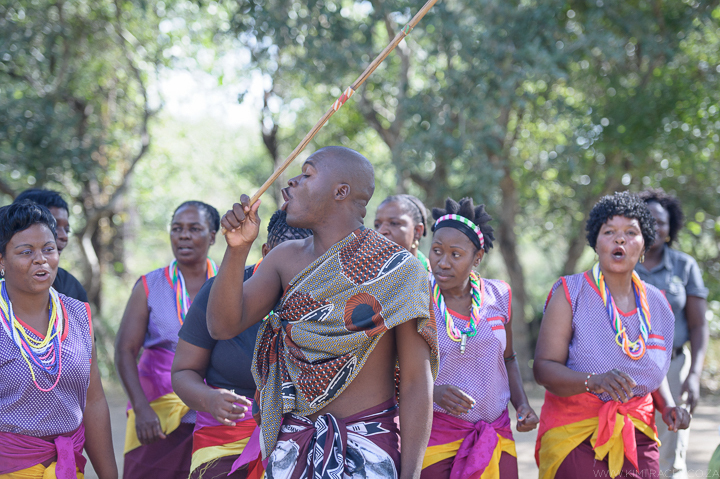 We were blessed to have the Mopani staff choir sing and perform traditional wedding songs at our ceremony at Tsendze. The ladies were dressed in colourful traditional outfits and the sole gent was in traditional animal hide and set the tone at first sight. Their voices and dancing were the ultimate introduction to our special, African wedding day. As my bridesmaids and then my dad and I walked down the aisle to their voices, I was overflowing with pride and happiness, and a sense of real setting and ceremony. It was indescribably special to me. I love the idea of trees representing life and this resonated with me from early into our wedding planning time. I wanted to find a way to incorporate the symbol of a tree representing our new life as a married couple into our wedding. Also trees were so beautifully connected to our wedding setting in Kruger with all its varied and glorious trees as part of its allure. The symbol of a tree was used on our wedding invitations (designed by Suzanne Adam) and engraved on the personalised wooden board placemats on our tables too, which guests took home as gifts from us. 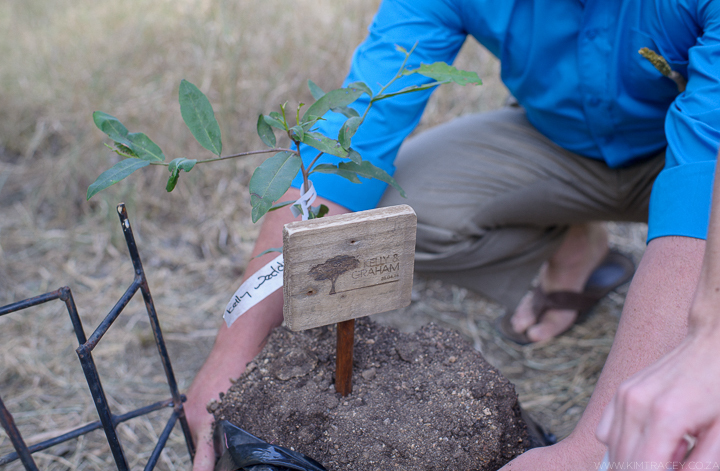 The idea came to me that we could plant a memory tree as part of our wedding ceremony. We both really loved the symbolism and natural meaning this would bring to our wedding, for us personally. So, after our vows were said and the birdseed confetti thrown, the congregation followed us to the spot we had prepared inside the camp. 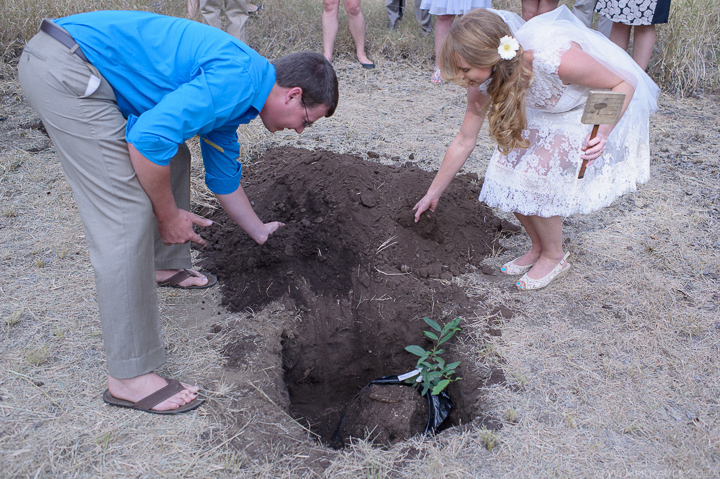 In our wedding clothes with soil in our hands, we planted our tree. It is a Jackalberry tree. One of the most proud and lovely trees found in Kruger. It was just a sapling on that day we put it in the ground to start its new life too and we hope that it will grow up big and strong so we can visit it on future trips to the park and to our incomparable wedding site. *The tree was sourced from the Skukuza indigenous nursery in the park. 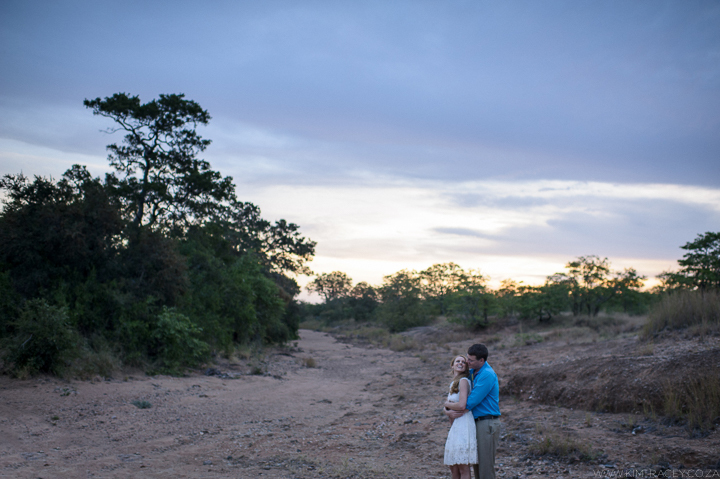 It’s was a massive bonus that our Kruger Park wedding setting was such a photographer’s dream. I mean just look at that setting. It is wondrous. Our wedding photos are amazing and I love them all. The photography element of our wedding was important to me. I love using photos to capture memories in our lives and I wanted the life and soul of our wedding to be captured too. Our lovely photographer, Kim, did just this. I keep saying to people that I feel like our photos look like how our wedding felt to us. Natural, full of love and so, so happy. We made those memories and we have the photos to prove it. There was something extraordinary about busting out in the open wilds and dancing on a dance floor made of earth. The slight dust cloud around our feet was obvious proof of stellar dance moves, which got even more excellent as the dancing juice in our glasses flowed. 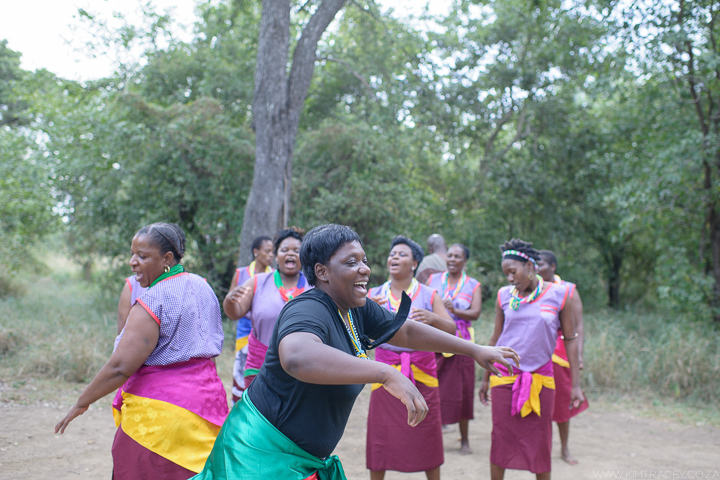 Dancing in celebration under the African stars, protected by a blanket of trees in one of our favourite wilderness places was a real highlight for us. Our destination wedding in the bush allowed us to be ourselves through our wedding. 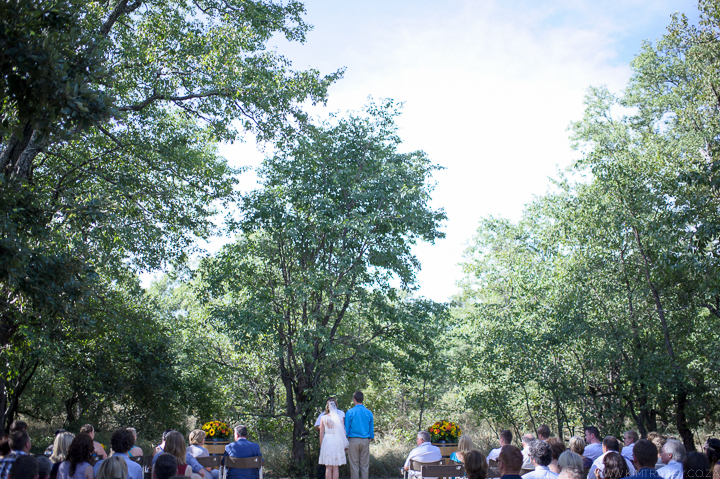 It expressed our casual and laid-back personalities just by being what it was: the perfect setting for our perfect wedding. We put a lot of ourselves into the hand-made décor and personalised little details. Everything was made to fall into place based on that foundation of the natural and the wildly beautiful. One of the beauties of getting married in Kruger was that we could plan to go straight into the honeymoon we wanted, immediately. No extra travel required. What a win. We had chosen to plan a 10 day Kruger honeymoon, with stays at numerous and very different camps along the route. We were excited to get started on that straight after spending one day relaxing and visiting with our family and friends at Mopani on the Sunday after the wedding. Our honeymoon WAS absolutely wonderful but not without a minor hiccup just before it. We were reminded of that little notion that some things just can’t be planned for. Unfortunately, our planned “chill out day with family friends in camp” was stolen from us on the Sunday after the wedding when Graham’s appendix decided that we hadn’t had enough excitement yet and insisted on being removed. We spent that first day as a married couple in Tzaneen hospital with Graham going in for surgery while the holiday party carried on at the pool in camp without us. At least they enjoyed that day enough for all of us and Graham and I were back in Kruger a day later to start our honeymoon. Just a day late and with a couple of extra stitches and meds. Our “Thank You Card.” Designed by Suzanne Adam. Image by Kim Tracy Photography. All images in this blog were captured by Kim Tracy Photography. 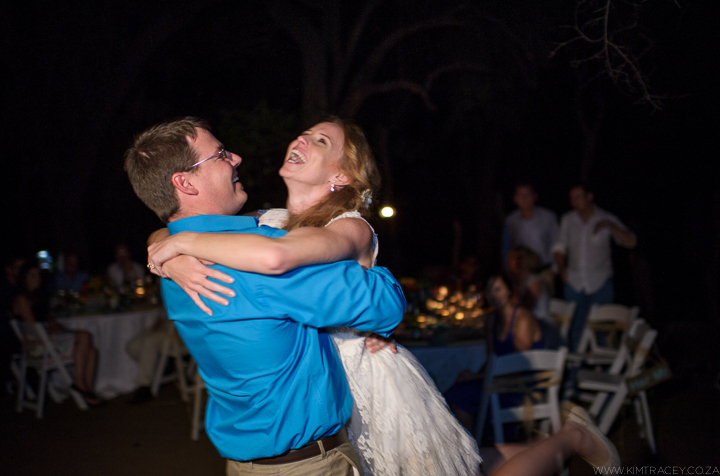 Some more of our wedding photos can be seen on Kim Tracy Photography’s blog. Aah, Kelly! Just loved reading through your blogpost. So special. Thanks for all the kind words! Such a fantastic read Kels. Full of goosebumps as your beautiful story took me back to that magical day and a wonderful holiday enjoyed by all. It was truly a wedding celebration overflowing with love, joy and tremendous adventure and excitement! I will cherish the memories and beauty of the day. Thanks so much Ceece! It honestly was the most perfect day and setting for us. 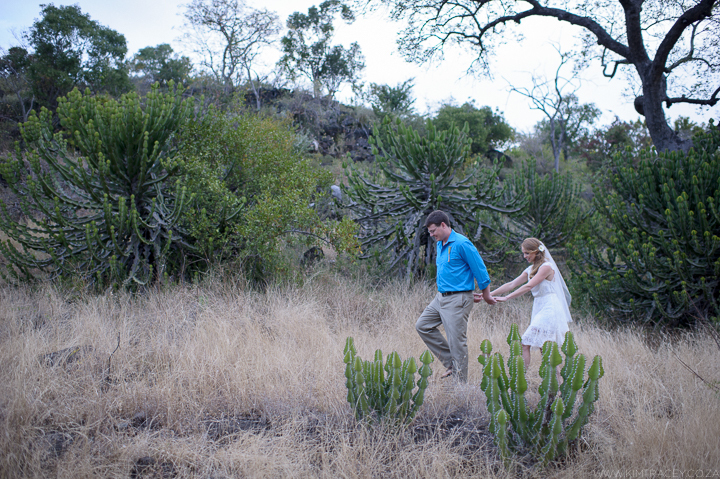 A proper South African bushveld wedding:) It still makes me smile so widely when I think back on it. Hi Kelly. Thanks so much for writing this… my fiance and I are getting married in the exact same spot in about a month’s time (well the ceremony is in a different area but the reception is also at Ndzopforini). We’re so excited and chose to have it there for many of the same reasons you and Graham did. Reading this has really assured me that we’ve made the right decision. I can’t wait! Is there any chance I could give you a call sometime to chat about some of the smaller details? I’m sure you’d have some some really useful tips. Thanks so much for your kinds words about my wedding blog. 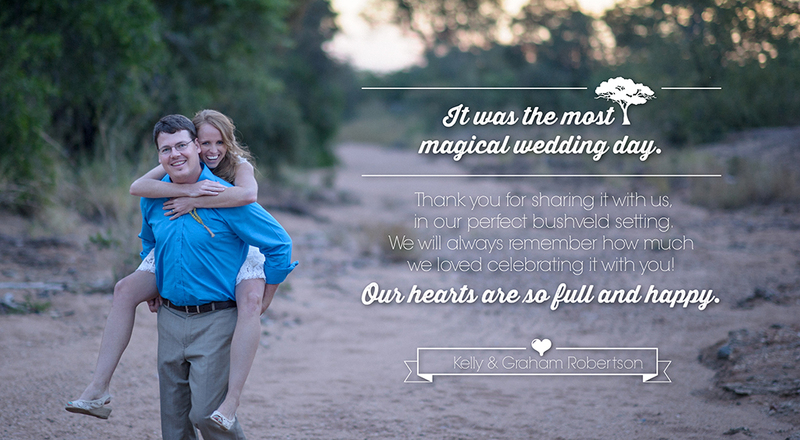 I can’t describe to you how much we loved every bit of our Kruger wedding. I’m so excited for you both for your upcoming one in that special place too. Please give me a shout with anything I can maybe help with. I’m so excited for you. Nzopforini was our absolute perfect bush wedding spot. I’d happily answer any questions and would love to hear your wedding details. I’ve dropped you a mail. How exciting. 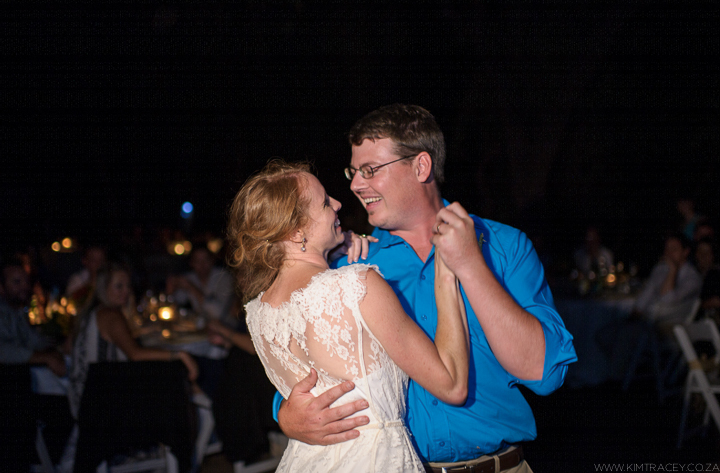 Our Kruger wedding was perfect for us. I’d be thrilled to help with any tips or experience based recommendations for yours. I’ve sent you a mail. Thanks for reading my blog and getting in touch.